Do travel brands have a responsibility to talk about Hurricane Irma? In the wake of Hurricane Maria and Irma and the earthquakes in Mexico, I explore whether travel brands should be talking about these issues. I’m not writing this from an expert viewpoint as having all the answers, but as someone who wants to create their own travel brand and is trying to make sense of it all. Watching the news on Tuesday morning, I felt devastated for the islands in the Caribbean. Having just been hit harshly by Hurricane Irma, now just a week later Hurricane Maria was on the way - and it was even worse than the one they had just faced. Dominica Prime Minister Roosevelt Skerrit gave live updates as the roof of his house was torn off, declaring his island had lost ‘all that can money can buy,’ with reports of widespread devastation. The full extent of the damage is currently unknown, what with the island having lost all power. 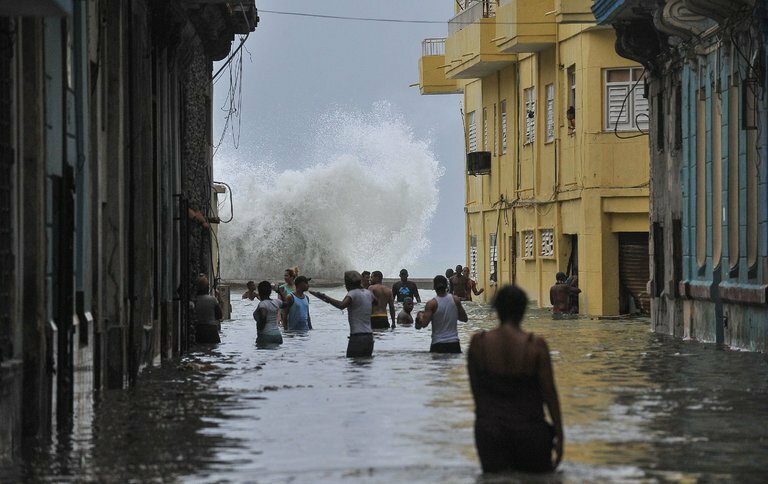 Puerto Rico has been declared as a disaster zone, with flash-flooding, mudslides and a loss of electricity, while on the same day, Mexico City was shook by a 7.1 magnitude earthquake that has currently killed over 200 people. Tweet from someone based in Dominica who described it as unlike anything she's ever experienced. At the same time as hearing about all of this, I was scrolling through social media. Naturally, I follow a lot of travel accounts i.e mags, bloggers, tour guides, websites, travel agents, etc. Looking through their posts of pristine destinations, it started to bother me that nobody was mentioning the disasters that were taking place. It seemed odd that they were fine to share pictures of the beauty of these places but were turning their eye when things got ugly. It reminded me of when Amandla Stenberg called out the Kardashians for loving black culture but not speaking out against racial issues. Can travel brands thrive off these locations without speaking out about the social issues that these countries are now facing? Discussing my discomfort with those around me, it didn’t seem that everyone agreed. One person pointed out that these travel brands aren’t newspapers, therefore had no obligation to mention what had happened. As Digiday points out, some ‘think that brands should keep out of conversations around social issues.’ Not only do some think it’s not their place, but doing so can also be seen as opportunistic. Pepsi’s Kendall Jenner advert was a perfect example of this, which The Drum summed up as jumping “on the ‘cultural bandwagon’ to have a share of voice, without using insight to help root their product or purpose in the issue.” But if a brand can root their purpose in the issue, then surely they should use their position to raise awareness and inform their audience. On the Caribbean island of Guadeloupe. Image from The Telegraph. In the Caribbean, the majority of these islands rely heavily on tourism - 90 percent of St Martin’s economy depends on it - and across the whole Caribbean region, an estimated 2.3 million jobs are supported by it. The destruction of the hurricanes has cost the region billions and is predicted to take years to recover from. No doubt that travellers will be put off visiting these places but this is where travel brands need to play a part. As the main drivers of tourism, it should be their responsibility to inform the audience how they can help and increase awareness as to how important it is for them to keep going there. Destroyed homes in St Martin. Image from NY Times article mentioned above. “So what should you do, as someone who loves the Caribbean? Come back. Of course, you should donate to any legitimate charity, send money to those in need, donate items for relief and recovery, something we’ll continue to highlight in the coming weeks. But the biggest thing you can do for the livelihood of this whole region is to keep coming back to the Caribbean.For now, keep traveling to the islands that were unaffected. Then, stay updated as islands rebuild and recover, and then travel there when they’re ready to welcome you. Because tourism remains the life blood of the Caribbean — it is the way this beautiful region makes a living, and without it there is no oil or copper or large industry to fall back on. It is the fundament of the Caribbean economy, and it is a direct conduit to the pocketbooks of the people of this region. Hurricane Irma put the Caribbean in an unfortunate global spotlight. But in a few weeks, the spotlight will dim and the news cycle will forget. There's more where that came from. Sign up for the monthly newsletter on people, places, and fresh perspectives.